If you’re a real estate agent you know how important it is to have the right people around you. You might work largely on your own, but you still have other people do various tasks for you, whether it’s in regard to researching the latest sales data, legal matters, marketing, or sales training. 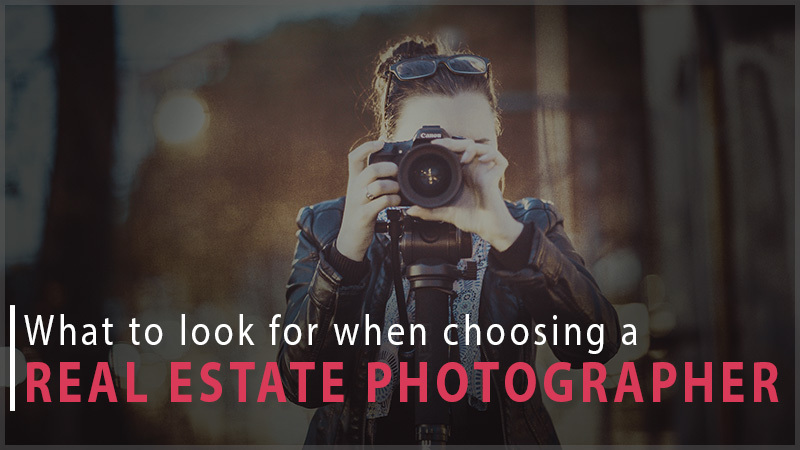 One of the most important people in that team of yours will be the real estate photographer. Why is the photographer so important? Most people who are thinking of buying or selling a home start their research online, and when they go online they are going to be looking at property listings where the photography dominates. When a buyer is house shopping they are scrolling through the results of their search, and if the photography does not catch their eye and have that “wow” factor, they’ll move on to the next home … or the next real estate agent. You see, choosing a real estate agent is a little bit like choosing a home, in that the photography plays a big role in whether that home, or agent, even gets a second look. So with that in mind, how does a real estate agent find the right real estate photography partner, someone who will help them win more listings and make more sales? Question 1. Does the quality of their work match your brand? Not all photographers produce the same level of quality, just as not all real estate agents provide the same service. Some are very amateurish, even though they are charging money for what they do, and others are highly professional, producing the kind of work you would expect to see in designer magazines. Look carefully at the quality of the photography, not the dollar value of the listings, and think about whether those images match up with what you want your clients to think of you. Do you want to be a high-end agent that provides the best service and top results for your sellers? If so, then you need a premium-quality photographer, and not one of the cheapest you can find. Question 2. Do they charge more than other photographers in your area? A photographer at or near the bottom of the pricing scale is there for a reason – either they don’t really know what they are doing when it comes to photography and feel they should charge accordingly, they don’t know their business very well and don’t understand their cost of sales (and probably won’t last long as a business), or they are new at what they do and are still experimenting. When you hire a photographer that charges more than the bottom feeders then you are more likely to have a photographer that is experienced, and knows how to handle agents, difficult homeowners, and a tough photographic situation. That’s who you want on your team. Question 3. Are they a small, local business? You’re probably aware of the large real estate photography companies that operate nationwide, but what you may not be aware of is that some of them pay low wages to their staff, resulting in a high turnover of people. You often never know who is going to turn up, and the photographer that does arrive is often working to a cookie-cutter approach, and they have little investment in ensuring that they deliver a high-quality product to you. Since they aren’t being paid very much, they just want to get in and get out as quickly as they can. On the other hand, the photographer that owns and runs their own business obviously has a lot more to lose, and they will work hard to make sure their clients receive the very best service. This photographer then becomes someone you can work with long-term, and they will get to know your specific needs and preferences. This is the kind of partnership that is valuable to you, and you’ll benefit from having someone that is committed to delivering a great result for you because they know that when you win, they win. Question 4. Can you work well with them? It’s all very well to have a photographer that is excellent at photography, but if they are difficult to work with, or arrogant, or poor communicators, then that can make for a difficult business relationship. To avoid these problems make sure the photographer you partner with is compatible with you, and whom you find easy to work with. Question 5. Can they handle difficult situations? We all know that real estate sales and photo shoots don’t always go to plan. Sometimes the homeowner isn’t ready, or the weather doesn’t cooperate, or the home is arranged or laid out in a difficult way. Some photographers can handle easy situations just fine, but when the sun is streaming in to the dining room, there’s a dark area around the corner and a stunning view outside, not all photographers can cope with that kind of problem. This leaves you as the real estate agent with less than optimal images. Make sure your photographer is not fussed when things go wrong, and they’re simply able to make things right. That’s not to say that the answer to every situation is, “just Photoshop that out”, because sometimes that doesn’t work either (sometimes it’s not possible to remove a great big mess in Photoshop). But what it does mean is that they are willing to work hard and they know how to handle situations when they aren’t perfect. Question 6. Do they understand the real estate market? A photographer that really understands the ins and outs of the real estate game and how real estate marketing works is extremely valuable to you as an agent. If they also know what’s currently going on in the real estate market in your area, and what features of a home are most appreciated by buyers, then they are going to be able to create imagery that best captures those features within your listings. Question 7. Do they respond promptly? There are times when you’re being pushed to get things through quickly, or you’re currently with an owner and you need to get that photo shoot booked. That’s when you need a prompt response from your photographer, and if they aren’t good at getting back to you and keep you waiting for days and days then that makes your job a whole lot harder. Just remember, though, that photographers are people too, and they can’t always reply within three minutes. They have other clients, they have families, and sometimes they even sleep, so be understanding of their needs as well.